With the advance of age, you may hope to find a simple way to create your own works of art. You try to find some tools to help you realize your artistic dreams. FotoJet can help you create your own unique art works even if without professional knowledge. FotoJet is an all-in-one graphic tool. You can use it to make photo collages, edit photos, design all kinds of social platforms banner, Poster, Flyer and so on. Use FotoJet make beautiful collage. FotoJet provide plenty of templates to us to make pretty collages and all kinds of photo cards. Let me show you how to make collage. First, open www.fotojet.com, click the COLLAGE or Make a Collage button to get started. After you enter collage page, you can see lots of beautiful sample pictures. Every one stands for a category, you can click the ones you like and start to make your collage. Following, I will show you the way to make a 3D collage. Click the 3D sample picture, then you will see many unique templates. Just click them to have a try. As long as you added template, you are allowed to upload your pictures. You can upload them both from your computer and Facebook. Or you can play with the sample pictures before upload yours. After upload, drag the pictures the template is OK.
Also, you can add some text and clip art to beautify your collage. Move your mouse to each of them. Click the ones you like to use. You can make some adjustments before save it. Drag them to the right position; change its color, size and opacity. What’s more, you can add outline and glow to text. The same way to add clip art, just try it if you like. By the way, if you want to change the background, just move your mouse to Background, choose the one you like among these sample pictures, or upload an image from your computer. Move mouse to DESIGN mode. Click Facebook Cover to customize yours. There are so many templates you can use, choose any one you like. Then you can use it directly after make some slight adjustments. By the way, in design mode, you can search images and clip art from Internet, this option can give you more choice to find images and clip art to use. I believe you will love it. Edit option is more powerful than others. It can change your common photos into professional ones. Let’s get started. 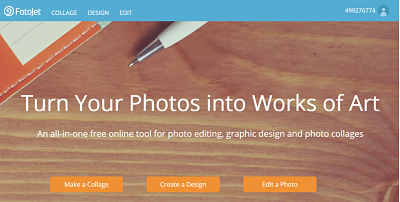 Move your mouse to EDIT, upload the photo you want to edit. There are some basic functions, such as crop, resize, rotate and so on. You can use them at ease. At the same time, you are free to use all the advanced options, like sharpen, focus, color splash, selective filter and so on. Then, you can use effect to pretty it. There are many kinds of effects you can use. Try them out, and apply the one you like most. You can add text and clipart as well. What’s important, there are overlays and frames you can use. You can make some adjustments for them, such as intensity and thickness. There are more things you can do with FotoJet, do not hesitate, and just try them all out. you just read the article about Customize Your Unique Art Works with FotoJet and can you bookmark or share with link https://ghchjgv.blogspot.com/2016/09/customize-your-unique-art-works-with.html so thank you.